Flood Box kits provide a quick and easy solution in case of flooded basements, garages and residential buildings. 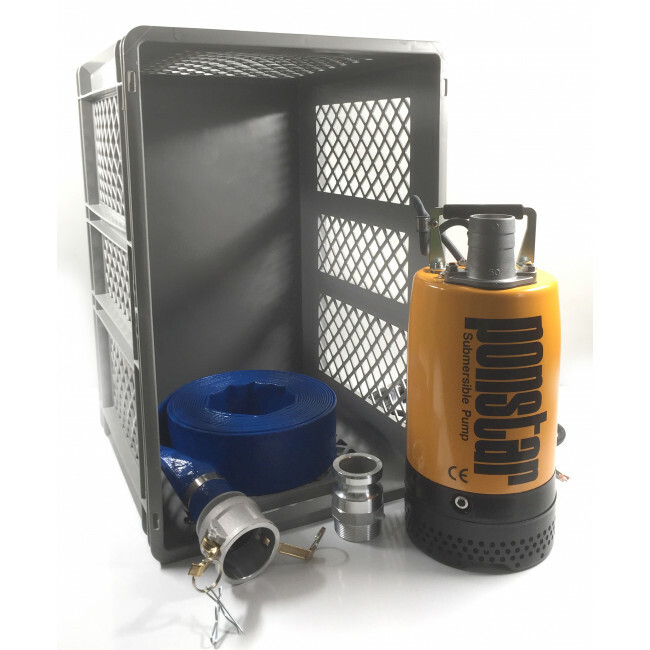 Ideal for a number of applications including draining construction sites, swimming pools, water from roof tank of buildings and more, the Koshin Ponstar PB-55022 240v Pump is a submersible drainage pump suitable for the heaviest duty of drainage applications and both clean and dirty water. The pump features twin mechanical seals, one carbon and one silicon in a lubricated chamber. The Ponstar is also designed so that the delivery flange can be altered from vertical to horizontal positions simply by adjusting two bolts to prevent bending of the hose. The included 20m Layflat Hose is weather resistant, lightweight, flexible and strong, as well as being collapsible when not in use. Available as an option is a pack of 5 Floodsax, the innovative self-inflating flood defence system set to revolutionise the way we control damage due to flooding. The semi-porous inner liner contains hundreds of absorbent crystals which absorb water to 90% capacity in just 3 minutes. Once the water is in there, it stays there and the bags act just like sandbags to keep floods at bay.